With the Hanford nuclear site decommissioned and designated as a monument, the area is now a peaceful wildlife-watching destination in a place humans have barely touched for decades. 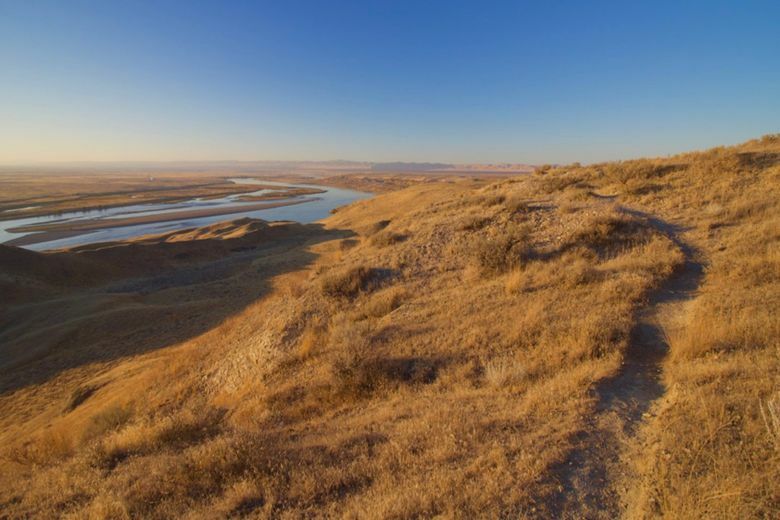 Nature and industry rarely intertwine the way they do in south Central Washington’s Tri-Cities, where three cities and three rivers converge in the middle of an arid plain. The rivers draw many different species, but inhospitable surroundings keep their numbers tightly concentrated. I’m only a casual bird-watcher, but it’s an especially appealing activity in warm, dry places in spring and fall. 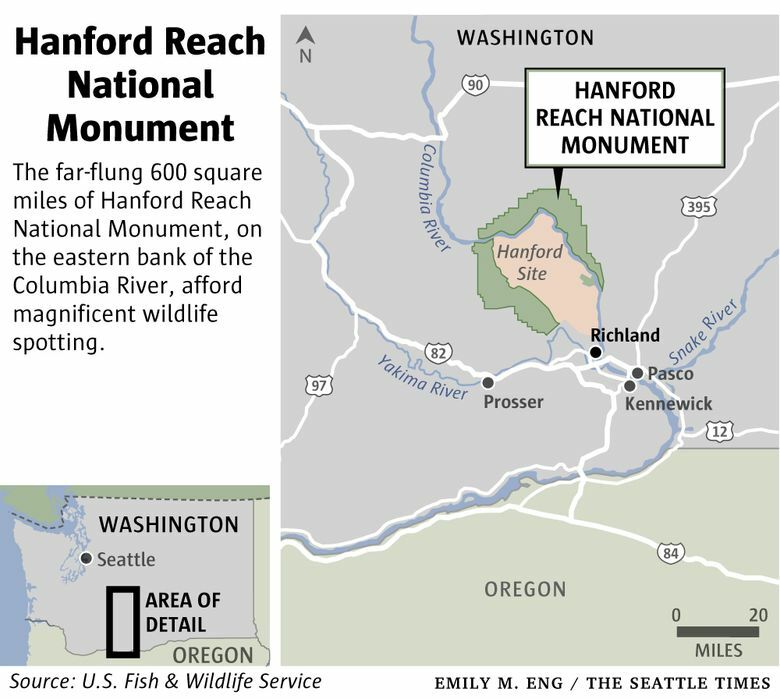 I’d been birding in the Tri-Cities before, but on the most recent trip, my goal was to take on the far-flung 600 square miles of Hanford Reach National Monument, on the eastern bank of the Columbia River about 45 minutes to the north. When I stepped out of my car at Hanford Reach, the first thing I noticed was the absolute silence, punctuated only by the occasional honks of a flock of geese far below the hillside. The Columbia River flowed before me in a wide, shining ribbon, amid hazy shapes of tree hummocks and tangled riverside grasses. On the far side, I could see far-off hulks of buildings remaining from the Hanford nuclear operation, part of the Manhattan Project. It was that project, not the area’s importance to wildlife, that led to the monument. This swath of land was declared off-limits to the public when the operation fired up in 1943; you couldn’t have folks gawking at your top-secret activities from right across the river. Now that the goings-on at the decommissioned site are less exciting (one hopes), the monument, designated in 2000, is a peaceful wildlife-watching destination in a place humans have barely touched for decades. The only routes in are a handful of unpaved roads, each with a few parking areas where you can stop to pull out binoculars or explore farther on foot. Ask at The Reach Museum or check a detailed map to get to the monument; Google Maps may lead you astray. I visited the Wahluke section, the closest to the Tri-Cities, and the White Bluffs area, reachable from state Route 24. Over leisurely hours, I wandered trails (human or animal, it was hard to tell which), stopping to take in birdcalls and sightings. Fall is a good time to go. Summer heat drives away some of the animals, but in fall many of them return, either temporarily or for the winter. And the sun shines far more often than in Seattle. The Columbia’s relatively lush banks are lined with willow, cottonwood and other trees — even a fruit tree or two left over from pre-nuclear settlers, who were evicted when the Manhattan Project began. Add in thickets of shrubs, reeds and grasses, and you have perfect bird habitat. The slopes leading up from the water are a different story, covered in sparse grasses, low brush and blobs of sage. Humans see desolation, but to meadowlarks and lots of sparrows, it’s home. Here and against the cliffs above, raptors (including bald eagles) and swallows swoop in the breeze. The range of habitats is one reason about 250 bird species have been spotted here, and dozens are common at any given time. In the middle of the Tri-Cities’ urban bustle, preserved natural areas lie between the rivers and surrounding subdivisions, shopping centers and industrial agriculture. Their proximity to civilization makes them easier to visit than Hanford Reach. 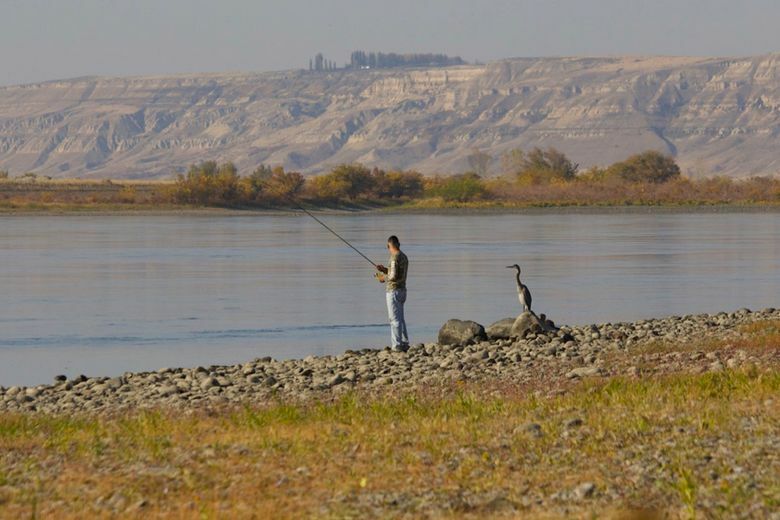 Many of the best in-town birding spots are near where the Yakima River joins the Columbia. A short causeway leads to easily navigable trails on Bateman Island in Richland, where the local Audubon Society hosts monthly group walks. Another stop to the northwest is W.E. Johnson Park, a completely undeveloped space full of wetlands and water birds. The 11 miles of trails at Chamna Natural Preserve lead to views across the water toward The Delta, another natural area. Walking these trails, I saw blackbirds, warblers, spotted towhees and meadowlarks. Beyond innumerable ducks and geese, I saw osprey and pelicans zooming above the water. Up the hill at Badger Mountain Centennial Preserve, you may see raptors along with expansive views of the cities below. Because these preserves are right in the middle of the urban center, it’s possible to hike and see wildlife in the morning, play golf or go wine tasting in the afternoon, and look for birds again in the evening. Not a bad day to soak up the dregs of late autumn. Go early: Birds and other wildlife come alive in the morning. Clear morning light is better for spotting and photographing. Do your research: Look into what kinds of birds you may see as well as their calls and habitats. That way, you’ll know not only know what you’re seeing but also when to get excited about spotting a rare species. Developed by the Audubon Society, the Great Washington State Birding Trail printed maps or app are good resources. Check out www.eBird.org for tracking bird sightings. Apps like iBird Pro are nice to have out in the field. Be prepared: Central Washington is inhospitable to human life in a number of ways. Hanford Reach, especially, is full of prickly plants and biting bugs. I recommend long pants, a hat, a long-sleeved shirt and sturdy shoes. Bring lots of water; there is no potable water in most natural areas.